1. 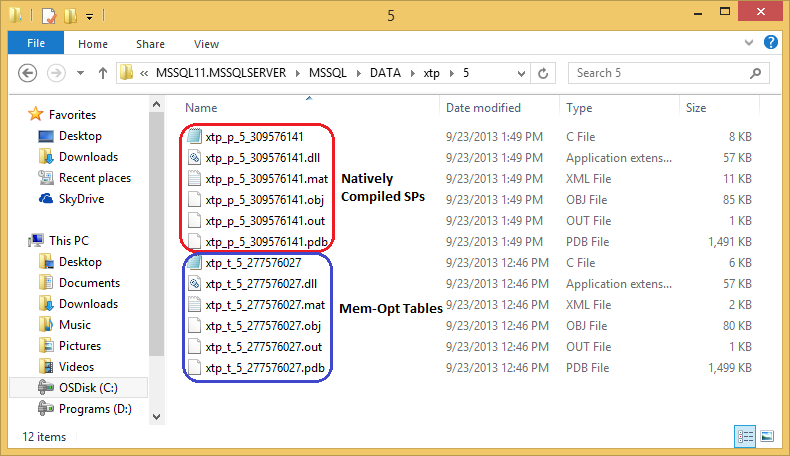 What’s [new with SQL Server 2014 & Hekaton] and CTP-1 [download link]. 2. [Installing] SQL Server 2014 with Sneak-Peek. 3. Working with [Hekaton] Tables. Here, in this post I’ll discuss more on what the new SQL Server 2014 does behind the scene while you create Hekaton or Memory-Optimized Tables & Native Compiled Stored Procedures. – It creates total 6 files for every Table & SP with following extensions: .c, .dll, .mat, .obj, .out and .pdb. – Most important are the C Code and the DLL files with four (4) other supporting files for each Table the Stored Procedure and stores them at following path: “C:\Program Files\Microsoft SQL Server\MSSQL11.MSSQLSERVER\MSSQL\DATA\xtp\5\”. — For files xtp_t_5_277576027: xtp_t is for Table, 5 is the Database ID and 277576027 is the Object (table) ID. — For files xtp_p_5_325576198: xtp_p is for Stored Procedure, 5 is the Database ID and 325576198 is the Object (Stored Procedure) ID.